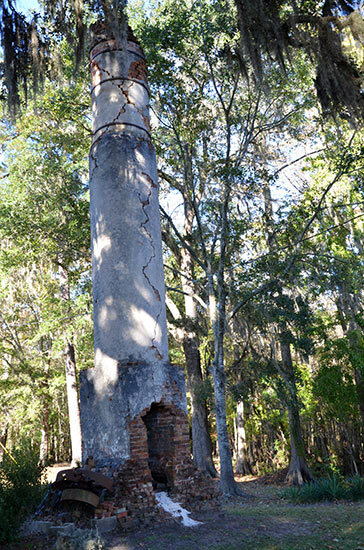 Located alongside the Waccamaw River, three miles from U.S. 701, on Old Bucksville Road, the towering brick chimney is the only remnant of a prosperous sawmill and a thriving 19th century community. In 1828, Henry L. Buck, a timberman from Bucksport, Maine, relocated to this region and established a timber empire on the Waccamaw River. The Buck family's three prosperous sawmills - including the Upper Mill at this site - reportedly made Henry Buck the richest man in Antebellum Horry County. Beginning in the Colonial Era, Horry County was a prime producer of timber and naval stores - the tar, pitch and turpentine used in the maritime industry. At times in the 18th and 19th centuries, more people in Horry County were engaged in naval stores production than in farming. In 1875, the Buck family experimented with shipbuilding, constructing the seagoing schooner Henrietta at the nearby Middle Mill in Bucksville. 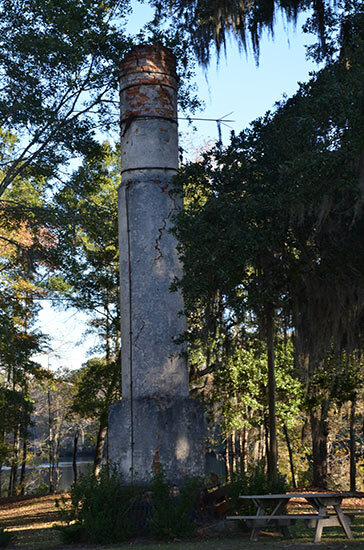 When the Waccamaw River is at low tide at the Upper Mill chimney site, the remains of riverside docks may be seen. Please respect private property. The 19th century Buck family home, a nearby private residence, is listed on the National Register of Historic Places.